There’s things I find fascinatingly perverse about cycling culture in the UK, having experienced cycling in the Netherlands as a child. By cycling culture I mean both the culture and norms amongst those who regularly cycle in the UK (and the various sub-cultures), as well as in the general culture. It struck me most the other week, when I cycled out of Glasgow early on the morning of the Pedal For Scotland event, out along the road leading back to Glasgow Green, where that event starts. There was a little more traffic than normal for a Sunday morning, because of the cars heading to PFS. It hit me that the UK is a country where, every weekend, people drive to cycle. They drive out to parks, country lanes, and sportives. They drive along roads they dislike cycling on, out to those roads to cycle on that are least quiet, if not free of cars. They drive out to sportives on open roads, looking for a feeling of safety in numbers. Clearly there is a great demand for cycling. Those ferrying their bicycles on their cars are just the tip of the iceberg – there are surely many more potential, casual cyclists who don’t care enough to invest in cycle racks, etc. Yet, the cycling culture, nay, the entire transport culture is so perverse here. The letter of the law is that children must cycle in with 50 km/h (30 mph), even 65 km/h (40 mph), motor traffic on many roads, because there is no cycle-path provision and it is illegal for them to cycle on the footpath. Only children under the age of criminal responsibility can safely get away with this, as they will not be prosecuted. However, legally, little children are supposed to cycle in amongst fast motor traffic on such roads! 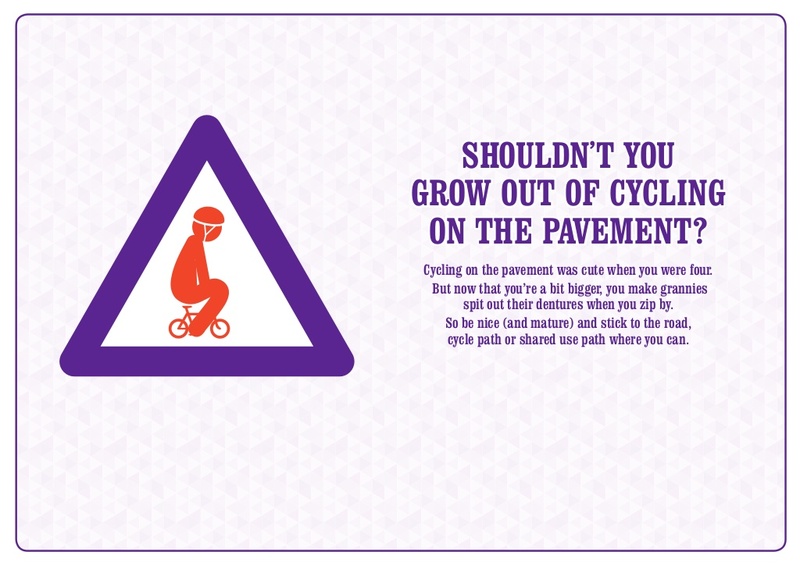 Even adults can feel uncomfortable cycling on these roads, and will cycle on the footpaths. The Scottish governments’ answer to this problem of a clear lack of safe cycling infrastructure? Run an ad campaign to tell such adults to grow up. There is never any room for dedicated cycle paths, even though most towns and cities are criss-crossed by multi-lane roads. At best, the cyclist gets either a useless little lane painted on the road that does nothing to protect them from motor traffic, but does bring them through the dangerous door-zone of parked cars; or the footpath gets designated “shared use”, bringing the cyclists into conflict with pedestrians instead, and having to cede priority at every little junction and property exit. The more experienced cyclists often ignore such useless infrastructure, with good reason. A sub-culture of cyclists are derisory of any attempt to argue for quality dedicated cycling infrastructure. A sub-culture of cyclists are afflicted by Stockholm Syndrome and believe in mandatory helmets for cyclists, even mandatory HiViz. Organisers of low-risk cycling events often impose a requirement to wear helmets on participants, typically by justifying it as a requirement of their insurer (even when false, e.g. British Cycling non-race event insurance does not require helmet use), thus condoning the ongoing “dangerising” and de-normalisation of cycling in the UK. Motorists who injure or kill cyclists are given derisory sentences, if they are even prosecuted and found guilty. Even motorists who deliberately knock down cyclists do not go to jail. If you want to murder someone in this country, use a car and claim “the sun was in my eyes” or “a bee came into my car”. I could go on and on. It’s almost enough to make me despair.